Beauty In The Mirror: Anti-Ageing Skincare / Finding what works? Anti-Ageing Skincare / Finding what works? Anti-ageing, wrinkles, fine lines and all make me nervous and give me itchy feet! I'm not adverse to wrinkles ( well...maybe an ickle bit). We're all going to get them eventually but I want to fight them off as much as I can, so I've been researching a little and have some new anti-ageing products which I think could be staples for me but I don't want to talk too soon. I've been trying them for a couple weeks and so far so good in terms of my skin accepting them and them slotting into my daytime/evening routines. As far as wrinkles/fine lines I can't speak yet but I still want to give them all a little shout out and would love to know if you've tried them and what you think. La Roche-Posay is a newish brand to myself, I've only tried their Thermal Spring Water which I loved and raved about here. So after some researching I was eager to test out the Redermic Anti-Wrinkle Firming Fill-in Care. I don't have many fine lines or wrinkles but I do have forehead frown lines which I hate! I wish I listened to my mum and stopped frowning all those years ago, I'm really hoping this treatment helps and reduces the look of them because they are starting to really bother me. I use this day and night only on my forehead. The texture is lovely and creamy and you don't need a lot.I've been testing out the Dry Skin version and found using it once a day on my forehead a little too much, I think because it is that little bit richer my skin doesn't agree with it, however using it alternate days seems to work better. I would be interested to try the combination version and see how that worked with my combination skin. I'm really interested to try more of the brand, so if you have any recommendations please comment below so I can check them out. 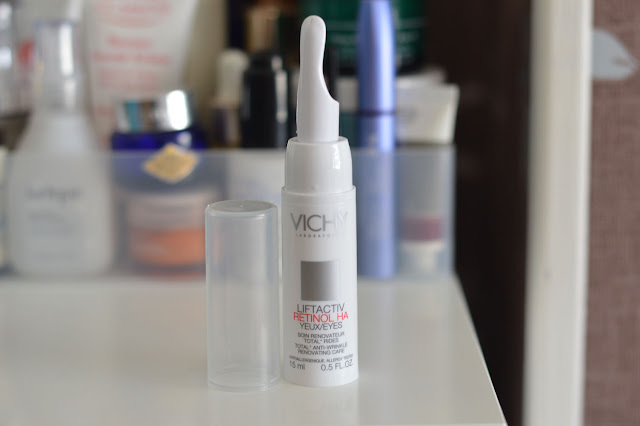 VICHY is another newish brand which I recently tried late summer last year, I've tried their Normaderm 3-in-1 Cleanser which was great on my t-zone and most recently the LiftActiv Serum 10 which I've used underneath my daytime moisturiser. The two newest anti-ageing products to make an appearance are the LiftActiv Night Cream and the LiftActiv Eyes Total Cream. Both recommended for women over 30 who want to target all types of wrinkles. Both containing retinol HA, which is known for anti-ageing benefits. The LiftActiv Night Cream soaks into the skin easily and feels great on the face. I like the packaging on the night cream but not so much on the eye cream, you need to be very careful when dispensing the eye cream because you have a tenancy of pressing down too quickly resulting in product wastage. I've been using the Eyes Total Cream in the evening and sticking to my Alpha-H Absolute Eye Gel for the mornings when I need that little cooling wake up call! I've found both products from the LiftActiv range a pleasure to use, they've kept my skin hydrated and looking plump which great when you're trying to combat any signs of ageing and also when you're trying to diminish fine lines which have already formed. If you're thinking about trying a new skincare range I would higly recommend both of this French skincare brands. They both have a fantastic selection of products to suit most if not ALL skincare needs. 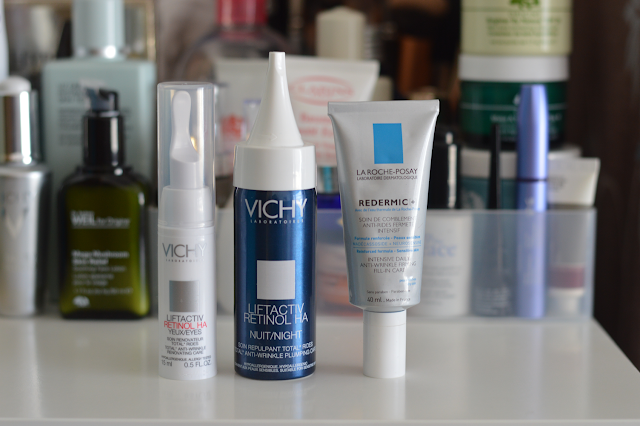 Have you tried La Roche-Posay or Vichy? I am using both Vichy and La Roche-Posay, I've always been very pleased with their products. Bioderma is good as well. I've just got introduced to the brand La Roche-Posay, even though I've heard of it before I haven't really gone for the buy. I did though purchase the Effaclar Duo after hearing a lot of raves about it on youtube, it took a while but now I think it has done a lot of difference for me... although, I'm actually not sure if it's the Effaclar Duo or something else. I do tend to introduce a lot of different products at the same time, I know, it's bad, and I have no idea which one's working the magic or if it's a combination of it all, but my skin has started seeing better days. From Vichy I'm very interested in their Dermablend Corrective Stick and Normaderm Anti-Imperfection Hydrating Care. I've wanted to try their Purete Thermale One Step Cleanser 3 in 1, but after reading the ingredients list I got a bit off put. They use Mineral Oil in a lot of their products which is a shame. Answering the evening skincare routine question: I try to keep it as simple and natural as possible. Rosehip Oil (natures Retinol A) and Argan Oil (high in vitamin E) on face and lightly under eyes and where wrinkles form, and Tea Tree Oil Spot-Stick where needed because I've got acne.